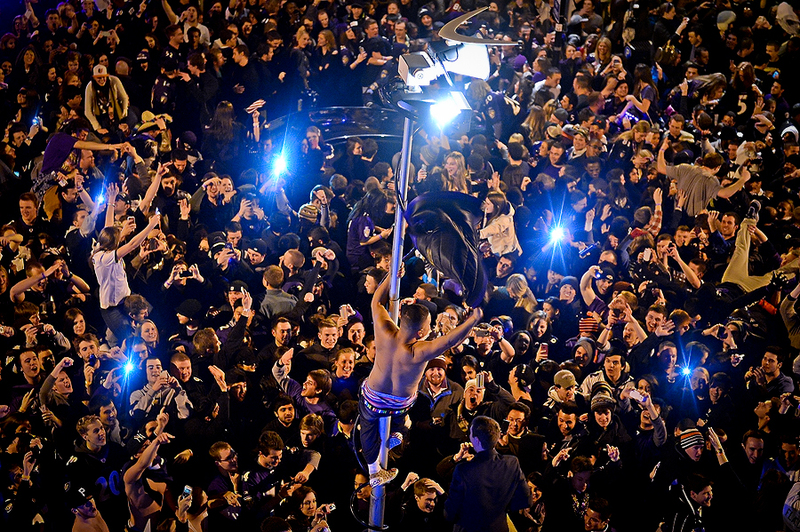 "A shirtless reveler climbs a television truck antenna, as he and other Baltimore Ravens celebrate in the streets after Super Bowl XLVII against the San Francisco 49ers in the neighborhood of Federal Hill on February 3, 2013 in Baltimore, Maryland. The Baltimore Ravens won the Super Bowl, 34-31, to capture their second championship title." Instead of being plopped down on my couch watching Super Bowl XLVII, I had the opportunity to cover the city of Baltimore for Getty Images. To be honest, I wasn't looking forward to being surrounded by crazy fans in bars downtown. But once I got to the Federal Hill neighborhood in Baltimore City, it was apparent that the energy was surreal and it would be fun night of coverage. This area of the city is littered with bars, so I knew it would be perfect for reactions and emotions all night long. The night started slow, but after transmitting around half time, I found a bar that was unbelievable. Revelers were dancing on the bars, throwing drinks and simply going wild during every play. I caught maybe five minutes total of the game and wasn't sure if the city would erupt with cheers and jubilation if the Baltimore Ravens won - or meltdown with tears and destruction if they lost. In a close finish, after the Baltimore Ravens captured their second Super Bowl title by defeating the San Francisco 49ers, and the streets filled quickly. The blocks surrounding me were more of a friendly celebration than riot. I knew I wouldn't get much on the ground in the start as the streets were filled like a chicken coop, so I made my way to the roof of Mother's Federal Hill Grille with help from a friendly employee. As I skated around the icy roof shooting below, I knew this vantage was perfect. The above image wasn't my favorite of the night, but thought it showed the celebration as it was. I did shoot some other images that I thought were timeless and a better visual of how Baltimore will be remembered when looked back on celebrating this momentous occasion. Alas, the above kept saying more about this super celebration. YOU'VE HIT THE BOTTOM OF THE PAGE, BUT THERE IS MORE. CHECK OUT THE ARCHIVE. All material on patricksmithphotos.com is protected by US copyright (©2006-2019 Patrick Smith or various publications). All rights reserved. Images may not be downloaded, copied, reproduced, republished, or distributed in any way without Patrick Smith’s written permission.